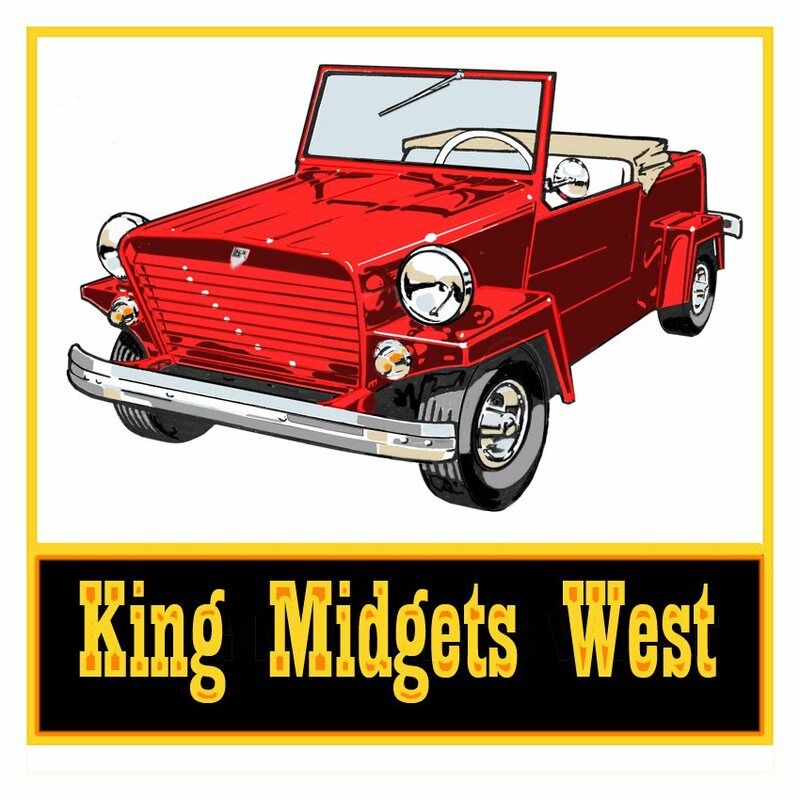 About a decade ago, a dozen or so Californians started having meetings that led to forming King Midgets West as a chapter of the King Midget Club. We now number a couple of dozen who own and drive a variety of King Midget models. Members need not own a King Midget, or bring their car to events. Guests are encouraged, but only members can drive a King Midget in our sanctioned tours. Our Chapter has no dues, no officers, no newsletter, no awards, no competitions and all King Midget fans from anywhere are welcome. We have just one rule---members must belong to the King Midget Club, www.kingmidgetcarclub.org, and accept their sensible bylaws. We communicate via this website and email. This red Model 3 is our logo and identification. In 2012 we donned blue polo shirts with this patch sewn on. In 2017 we designed Chapter jackets and a placard used to lure the unsuspecting into catching King Midget Flu and joining our fun. There is no obligation to buy or wear this stuff, but it has proven helpful at car shows. In addition to our two annual sanctioned meets in California there are occasional encounters at car shows and each other's garages. We support the "Mother Club" by paying our annual dues and attending King Midget Jamborees when we can. The national club's newsletter is printed by one of our chapter members and a chapter project is to assemble and mail the national newsletter three times per year. We make a party of stuffing some 400 newsletters, sometimes in conjunction with a Chapter Bash. We're focused on California but some of our members are scattered around the Western states and we encourage them to drop by when they can, even if it's just to join one or more of us in buzzing around the block or kicking tires. We like driving our Kings, helping each other, and exchanging tips to keep them running. Like the International King Midget Car Club, we're "people oriented"--people who share a fascination with these little American cars, and have fun together. If you're interested in participating, just contact us at the address below.